It took five years for DeMar DeRozan to become an All-Star in the NBA. In that time, the two most important events he witnessed were Chris Bosh leaving to join LeBron and Dwyane Wade in Miami and, two summers later, his team trading for Kyle Lowry, the oft-disgruntled yet talented point guard. That first Lowry-DeRozan team lacked the moxie of later editions, but with the pair each starting 79 games and immediately posting career highs across several categories, it was clear something special was brewing above the border. It is no mistake that DeRozan’s first All-Star appearance, in 2014, coincided with the Raptors’ first playoff appearance since 2008, kick-starting a still-active run of five consecutive postseason showings, the longest in the franchise’s history to date. Next to Lowry, DeRozan flourished, and next to DeRozan, Lowry felt enabled, his fiery nature having found the perfect counter for close games in crunch time. Here is how that playoff run has gone: a seven-game loss to the 6-seed Brooklyn Nets, featuring old versions of many players you could have found visibly screaming in dunk poses set against neon backgrounds on posters in the early aughts; a sweep at the hands of the Washington Wizards in 2015, which gets more embarrassing by the day; LeBron James in 2016; LeBron James in 2017; LeBron James in 2018. Something had to change this summer. It wasn’t going to be Ujiri, of course. Lowry had just signed a three-year deal worth $100 million the year prior. DeRozan had signed what was, at the time, the second-biggest deal in NBA history in the free for all summer that was 2016, a five-year contract for $139 million. Yet, DeRozan’s contract and skill set became imminently more movable, particularly after Kawhi Leonard’s people – the term you use for the nondescript bunch of hangers-on who help dictate the course of your career and, therefore, your life in the NBA – made it known that he was no pleased in San Antonio. So it was that DeMar DeRozan, the Toronto Raptors’ all-time leading scorer, who had proclaimed himself the living embodiment of the capital city of Ontario upon signing his contract, was forced to relinquish his personal international civic enrichment program, abandoning all he had built with Lowry against his will for the vermeiled estate in San Antonio, where his Kobe-influenced midrange game would find a complementary home next to LaMarcus Aldridge, another would-be franchise savior who didn’t stick around. 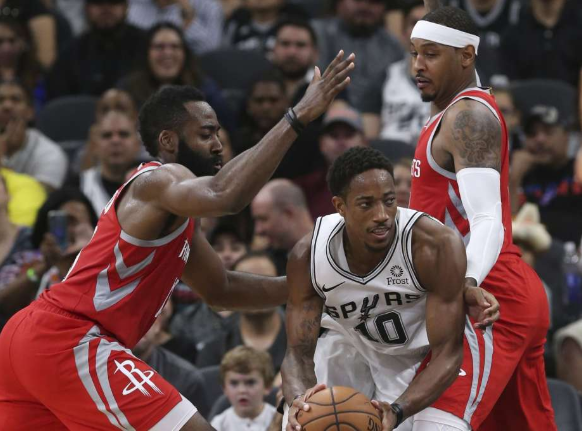 DeRozan, who learned about the trade in a Jack in the Box parking lot and stayed there for, according to him, two hours in shock, has stood up to the challenge that San Antonio presents, averaging career highs in points, assists and rebounds on 53% shooting. For the team that took the highest frequency of pullup twos last year, per NBA.com, DeRozan has added his own wizardry. After leaving the only NBA home he’d known for nine years, DeRozan has scored 20+ points in eleven of fourteen games this season. He has 5+ assists in eight of those. He is working toward his peak, even having been an All-Star in four of the past five seasons, and even without Kyle Lowry to spur him along. Maybe ex-Raptor teammate Rudy Gay’s presence on the Spurs is enough of a calming reminder for DeRozan. Spurs coach Gregg Popovich is known to get the most out of his players, and if there is any 29-year-old in 2018 who has some other element, another facet remaining to be seen, it is DeMar DeRozan, the modernized relic of a bygone era who nevertheless remains an important figure in his team’s lineup. DeRozan, somehow, improbably, may still not be a fully realized player. All we can do is watch and wait.